Unlike most butterflies, gray hairstreaks do not prefer one specific habitat. They are widespread in tropical forests and open, temperate woodland areas. 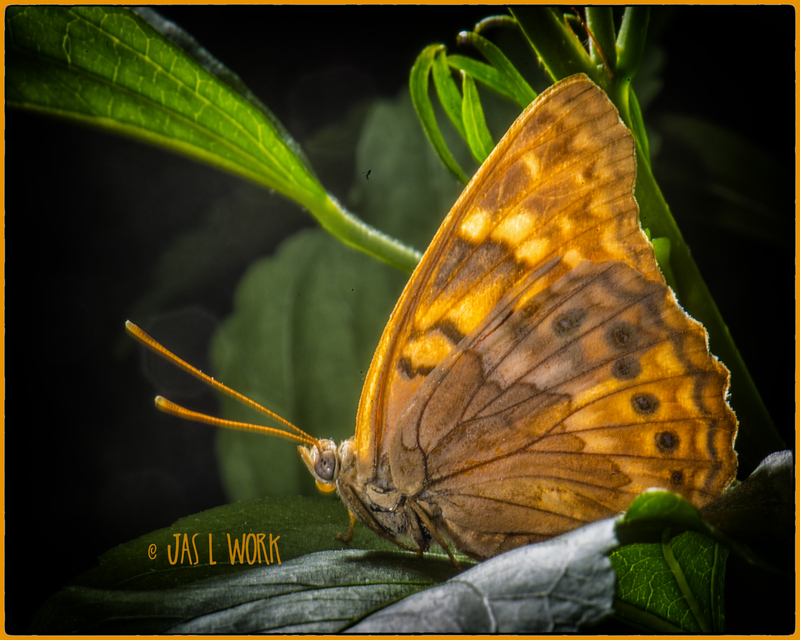 They can also be found in meadows, crop fields, neglected roadsides, and residential parks and yards are often homes of this fascinating butterfly. So part two of the Metamorphosis thing. The whole process just takes my mind to places I cannot quite put into place. I am sure the caterpillar has less of a thought process than me. But I got to figure when he goes into the cocoon thing, he has to figure this it it, I’m one dead bug. And then after a few days, weeks months whatever it takes, he awakes and emerges a whole new and different creature. This cooperative little beauty sat (do butterflies really sit?) and posed away for me a good fifteen minutes. I was allowed the time to get close and play with my lighting. He was busy preening himself as if trying to make sure to be groomed and presenting his best side. It is most alway fruitful when I decide to take a mindful stroll around my small grounds. On a casual glance, I will not see. When I don my macro kit and keep my eyes open it almost always becomes a seek and you shall find proposition. With the oppressive heat, it is not until around 8:00 pm before the temp drops to a tolerable level. I spied this wonder about a foot higher than eye level. It became obvious that he was at rest for the night. He sat in the same place waiting imperturbably while I found something to elevate myself to his level. I was able to hold one of my lights back behind him to send light through his wings. It gave the heavenly glow to the photo that I felt in my heart. One of the ruminating rituals of fall is when catching a flash of orange and black of the Southern flight of monarch. Seeing their serpentining flitter of their constant three steps forward and two steps back journey south. I seem to be a little east of the main concourse and really only get to see two or three a day on the migratory route. I can remember a time as a child in Odessa TX when we were in the midsts of the main stream of the flight. Monarchs roosted on most every bush and the blaze of color truly had an impact on my wayward mind. Literally thousands of the beautiful creatures gathering in mass surely for no other reason than my delight. I was not a library kind of kiddo, but I was off to the row off big books for information. I wanting to know where they were going and why. I stared with the wow factor of an image of a man standing high in the Sierra Madres. His arms out stretched and his body entirely engulfed with butterflies. He looking to be a mummy encased in Monarch butterflies. I longed to be in that place. I have always been plagued with the curse of wanting more and thousand of butterflies on a bush in my back yard now seemed small potatoes. Now as age has calmed just a tad of the always wanting more. I am fully content to have the pleasure of seeing just one winging his way South against the prevailing winds. It is a small gift of bewilderment that I get to catch a photo as they refuel for flight. Yet, I still long the stand on that Mexico mountain shrouded in such a glorious gift.